With the passing of soprano Elizabeth Connell, the opera world has lost one of its most remarkable artists. In a career that lasted close to four decades, Connell left an indelible mark on the world of opera. Born on October 22 1946 in Port Elizabeth, South Africa to Irish parents, Connell studied music at the University of Witwatersrand in Johannesburg before going on to the London Opera Centre in 1970. 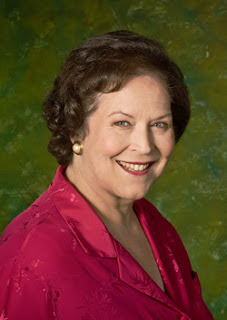 She won the Maggie Teyte Award in 1972 and made her professional debut as a mezzo-soprano later that year at the Wexford Festival as Varvara in Janacek's Katya Kabanova. Highlights of her early career include Prokofiev's War and Peace at Opera Australia, the first opera production at the new Sydney Opera House. It marked the beginning of her long association with Opera Australia that lasted her whole career. Connell was noted for her wide-ranging repertoire that included German, Italian, Russian, Czech and English works, with remarkable success in the operas of Wagner and Strauss, as well as Verdi and Puccini, this last one late in her career. She came into prominence as Ortrud in Bayreuth in 1982. Her career was focused in Europe and Australia, with occasional forays in North America. I first heard her as Kostelnicka at the COC Jenufa around 1982, and five years later as Ariadne. I also recall vividly her Lady Macbeth when I traveled to the Met to hear her around that time. (And who can forget that unfortunate incident on a Saturday broadcast of her Macbeth that same season when a man fell to his death and the last act had to be cancelled?) I also remember her Fidelio at San Francisco Opera in the 1990's. The last time I heard her live in a complete opera was a concert Elektra with the Montreal Symphony Orchestra at Place des Arts about ten years ago. She wasn't glamorous on stage, but the moment she opened her mouth, one was struck by it's freshness and youthful timbre, without a hint of a wobble, truly remarkable for someone her age. I saw the telecast of her 2004 Fidelio Leonore, staged on Robben Island to mark the 10th anniversary of the release of Nelson Mandela. Though very heavy physically at the time, Connell triumphed through the sheer power and beauty of her singing and the sincerity of her acting. It was a most moving experience. A rather unexpected Indian Summer in her career occurred as a result of her stepping in for an ailing Irene Theorin as Turandot at Covent Garden in 2008, receiving critical accolades. That was her first return to the Royal Opera after an absence of many years. This was followed by her Mother in Humperdinck's Hansel und Gretel, a performance captured on video. On the concert stage, thanks to her large voice with its brilliant top, her most frequently performed work was Magna Peccatrix in Mahler's Symphony No. 8 and Beethoven's Ninth, two works that she sang all over the world. Though she made relatively few recordings, her Carlotta in Schreker's Die Gezeichneten on the Decca Entartete Musik Series is much admired; the same can be said of her Mahler Eighth under the baton of Klaus Tennstedt. Also noteworthy is her Schubert disc with pianist Graham Johnson on the Hyperion label. On video, her Ortrud, one of her best roles as a mezzo was captured in a 1982 Bayreuth performance with Peter Hofmann and Karan Armstrong under the baton of Woldemar Nelsson.